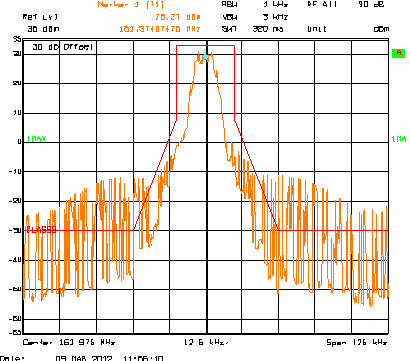 AIS data is transmitted using GMSK modulation, filtered to fit within the confines of a 25kHz channel mask (see image below). Data sent out side of this mask is liable to be lost and anot be received by other AIS devices operating within the AIS system. Transmitting data within this mask, ensures the integrity of the AIS system and enasures all data is received. 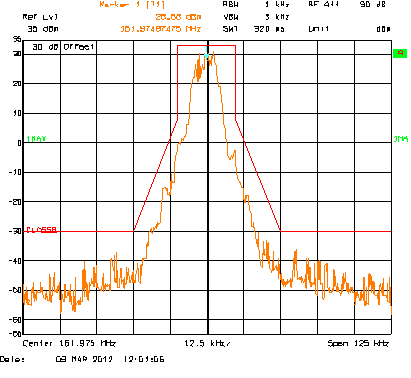 In figure 1, the data isd sent within the mask (the lines that surround the radio wave. all of this data will be received by other AIS devices. In figure 2, some of the data is sent outside the mask, which will not be received by other AIS devices in range. For 'Class B' operation, the channel mask is specified for a slotted transmission burst, and so includes, and accounts for, the effects of transients at the beginning and end of the data burst.